The easiest way to create a QFileDialog is to use the static functions. 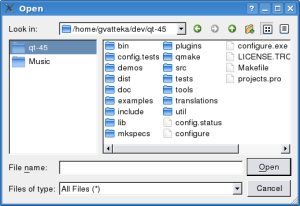 On Windows, Mac OS X, KDE and GNOME, these static functions will call the native file dialog when possible. QFileDialog::DirectoryOnly 4 Use Directory and setOption(ShowDirsOnly, true) instead. QFileDialog::DontResolveSymlinks 0x00000002 Don't resolve symlinks in the file dialog. By default symlinks are resolved. QFileDialog::DontConfirmOverwrite 0x00000004 Don't ask for confirmation if an existing file is selected. By default confirmation is requested. QFileDialog::DontUseNativeDialog 0x00000010 Don't use the native file dialog. By default, the native file dialog is used unless you use a subclass of QFileDialog that contains the Q_OBJECT macro. QFileDialog::ReadOnly 0x00000020 Indicates that the model is readonly. QFileDialog::HideNameFilterDetails 0x00000040 Indicates if the file name filter details are hidden or not. QFileDialog::DontUseSheet 0x00000008 In previous versions of Qt, the static functions would create a sheet by default if the static function was given a parent. This is no longer supported and does nothing in Qt 4.5, The static functions will always be an application modal dialog. If you want to use sheets, use QFileDialog::open() instead. This function will set the labels for the FileName and Accept DialogLabels. It is possible to set custom text after the call to setFileMode(). When the selection changes and the dialog is accepted, this signal is emitted with the (possibly empty) selected file. This function creates a modal file dialog with the given parent widget. If parent is not 0, the dialog will be shown centered over the parent widget. The dialog's working directory is set to dir, and the caption is set to caption. Either of these may be an empty string in which case the current directory and a default caption will be used respectively. The options argument holds various options about how to run the dialog, see the QFileDialog::Option enum for more information on the flags you can pass. To ensure a native file dialog, ShowDirsOnly must be set. On Windows, Mac OS X and Symbian^3, this static function will use the native file dialog and not a QFileDialog. On Windows CE, if the device has no native file dialog, a QFileDialog will be used. On Unix/X11, the normal behavior of the file dialog is to resolve and follow symlinks. For example, if /usr/tmp is a symlink to /var/tmp, the file dialog will change to /var/tmp after entering /usr/tmp. If options includes DontResolveSymlinks, the file dialog will treat symlinks as regular directories. On Windows the dialog will spin a blocking modal event loop that will not dispatch any QTimers, and if parent is not 0 then it will position the dialog just below the parent's title bar. On Symbian^3 the options parameter is only used to define if the native file dialog is used. Предупреждение: Не удаляйте parent во время выполнения диалога. If you want to do this, you should create the dialog yourself using one of the QFileDialog constructors. The function creates a modal file dialog with the given parent widget. If parent is not 0, the dialog will be shown centered over the parent widget. The options argument holds various options about how to run the dialog, see the QFileDialog::Option enum for more information on the flags you can pass. On Windows, Mac OS X and Symbian^3, this static function will use the native file dialog and not a QFileDialog. On Symbian^3 the parameter selectedFilter has no meaning and the options parameter is only used to define if the native file dialog is used. On Unix/X11, the normal behavior of the file dialog is to resolve and follow symlinks. For example, if /usr/tmp is a symlink to /var/tmp, the file dialog will change to /var/tmp after entering /usr/tmp. The options argument holds various options about how to run the dialog, see the QFileDialog::Option enum for more information on the flags you can pass. On Symbian^3 the parameter selectedFilter has no meaning and the options parameter is only used to define if the native file dialog is used. On Symbian^3, this function can only return a single filename. This is a convenience static function that will return a file name selected by the user. Файл не должен существовать. It creates a modal file dialog with the given parent widget. If parent is not 0, the dialog will be shown centered over the parent widget. The dialog's caption is set to caption. If caption is not specified, a default caption will be used. On Windows the dialog will spin a blocking modal event loop that will not dispatch any QTimers, and if parent is not 0 then it will position the dialog just below the parent's title bar. On Mac OS X, with its native file dialog, the filter argument is ignored. On Unix/X11, the normal behavior of the file dialog is to resolve and follow symlinks. For example, if /usr/tmp is a symlink to /var/tmp, the file dialog will change to /var/tmp after entering /usr/tmp. If options includes DontResolveSymlinks the file dialog will treat symlinks as regular directories. On Symbian^3 the parameters filter and selectedFilter have no meaning. The options parameter is only used to define if the native file dialog is used. This function connects one of its signals to the slot specified by receiver and member. The specific signal depends is filesSelected() if fileMode is ExistingFiles and fileSelected() if fileMode is anything else. Returns a list of strings containing the absolute paths of the selected files in the dialog. If no files are selected, or the mode is not ExistingFiles or ExistingFile, selectedFiles() contains the current path in the viewport. Note that the model used is QFileSystemModel. It has custom item data roles, which is described by the Roles enum. You can use a QFileIconProvider if you only want custom icons. See also itemDelegate(), setIconProvider(), and QFileSystemModel. Sets the urls that are located in the sidebar.